Allison Doyle grew up near Chicago, IL and attended the University of Illinois at Urbana-Champaign, where she earned a Bachelor of Science degree in Human Development and Family Studies. 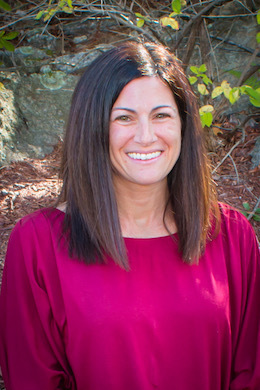 Allison went on to graduate school at the University of New Hampshire where she earned a Master of Science degree in Family Studies: Marriage and Family Therapy. Allison is a NH Licensed Marriage and Family Therapist (LMFT) and a Clinical Fellow in the American Association for Marriage and Family Therapy. Allison worked at a state agency doing intensive home- based family therapy before opening Bedford Family Therapy in 2004. In 2009, Allison completed her RYT 200, Yoga Teacher Training. Allison uses the yoga philosophy and breathing principles to enhance her therapy work when appropriate. Due to her frequent work with couples, Allison pursued advanced training in Emotionally Focused Couples Therapy (EFT) to better assist couples in distress. She earned her certification in Emotionally Focused Therapy in 2016 and is a member of ICEEFT (The International Centre for Excellence in Emotionally Focused Therapy). Additionally, Allison uses Family Systems Theory, Solution-Focused Therapy, Cognitive Behavioral Therapy, Mindfulness Training and Communication skills in her work with clients. Allison has experience doing office-based as well as home-based therapy. Other areas of emphasis and expertise include: Individual, couple and family therapy, adolescent counseling, parenting skills, fertility issues, life cycle changes, child behavioral therapy, ADHD, school-related concerns, personal development, depression, anxiety, focusing on strengths and solutions, as well as collaborating with community providers.